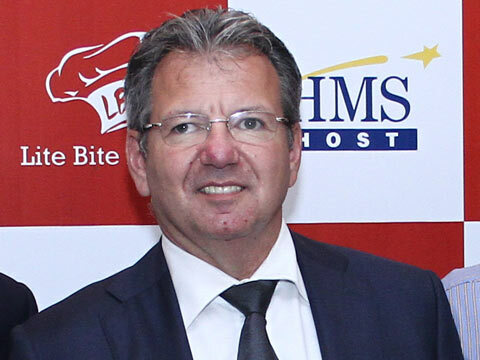 Talking to Restaurant India, Walter Seib, CEO, HMSHost International, tells about its partnership with Lite Bite Foods in India and their expansion plan. As you are the largest providers of F&B services for travelers. What growth can we see in India? As I said before I have seen that the growth is growing 20 percent in India. And our sale continuously going to increase and even Lite bite Foods has said that we want to target around 500 crores in 4-5 years from now. The real potential can’t be estimated. Airports are easier but railways have more potential. Even nobody is in highway, nobody know what sales will it bring. So, we want to take the first part of the call. Which according to you is the best revenue generating location when it comes to travel? Airports are the best location. Even in airports you have to see different sectors. I see mainly three sectors i.e. Location, location and location. We look at low fare airports, leisure airports and business airports. Tell us something about your partnership with Lite Bite Foods. What all locations are you targeting in India? We have many partnerships outside. Partnerships are always very existing part. We always team up with local partner, with family companies to marketise. For example, two years back in Vietnam we started, now we are 6 airports and planning more outlets. We have three airports in Indonesia, all are local partners. We are targeting especially three sections i.e. airports, train stations and highways. Our primes focus will be airports. Second will be railway stations, if government does some changes, railway stations will have more potential than airports. Which are some of the brands who are your biggest partners? Which according to you is the traveler’s choice? I had just said that we have a very old concept for our company. I am reluctant to talk about any brands. Globally we have relationship with major brands like pizza, KFC etc. We look at market, democracy, consumers and then we decide what fit best for that. Our company is in this business for more than 150 years. We see reliable partners and where we can see to extend our partnership, we do so. Travelers are of different types. There are travelers who travel twice or thrice in a week, for them it is natural. But when they travel with family, they make different choices. And the choice depends on different occasion and purpose of travel. What are the unique experiences that make HMS Host different from any other service providers? “We are seen global but act local”. Our company is known for the good management. We are also business provider, Food & beverages, hospitality and our biggest assets is our people our staff. We spend lot of time in interacting, training and educating our people. We also promote our people in turnover. We are unique because of our operational skills which focus expertise, right time, right number of staff, right concepts, right opening hours etc. We also development skills, analyze airports, understand the need of the travelers, which concept should be use and where. 900 million people come every year in our restaurant. We understand the need of our customers. We want our market share in Europe and in America. And internationally, China, Southeast Asia, India, UAE and Middle East. Are you planning to sign any franchisee deal? We have some plans of franchise in future. We are working on Italian concepts; Italian food and we are even doing some tests on them. I won’t exclude that opportunity. About Us: My Hotline is a Cloud Communication and Business Solutions.. Basics on How to Start Medicine Business..
Why Restaurateurs should look beyond Metros..
We are targeting at cities like Delhi, Bengaluru- ..
Amanté Among The Top 100 Franchise Brand..
What Sets Strategic Procurement Apart?.. ​Content Marketing Tips For Healthcare Brands..